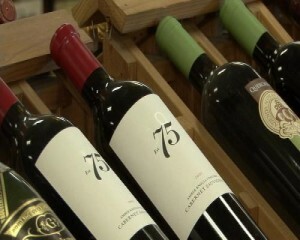 SYRACUSE, NY- March 29 marked the end to a long debate for Albany lawmakers over one measure of the 2009-2010 state budget: should the sale of wine be legalized in state grocery stores, convenience stores, pharmacies and gas stations? And the verdict is in: no. Legislative leaders agreed in a three-way budget proposal unveiled today to not lift restrictions on wine sales. Instead, they will opt to create new revenues for the state by raising the excise tax on beer. For many liquor store owners, this agreement marks the end of a long campaign they have fought to remain the sole providers of wine in New York. After Governor Paterson first suggested the idea back on December 16 of last year, several liquor providers united in a coalition aimed to defeat the proposal. Their argument was that allowing wine to be sold in grocery stores would cut into their profits and result in several private liquor stores being run out of business. Hallinan, an active member in “The Last Store on Main Street” coalition said that at 70 percent, wine makes up a majority of his sales. The fifth generation owner of the liquor store in Camillus said he was already prepared to lay off one worker if the measure in Albany went through. On the other side of the ball were the state’s many grocery chains, who said that lifting the restriction on sales would be in line with a consumer demand that has been building for quite some time. Rochester-based Wegmans Food Markets was one of several major chains to solicit the signatures of its customers to get support for the proposal. “Based on the information that was shared with us as it relates to some consumer polls that were given, it demonstrated that 70 percent of consumers wanted the sale of wine in stores,” said Evelyn Carter, Division Consumer Affairs Manager for Wegmans on March 4. Proponents also argued for the over $100 million in new tax revenue that the proposal was said to generate for the state, as well as the increased exposure it could give to several small area wineries. But Well’s opinion was just one of New York’s over 200 winery and vineyard owners. While over 60 singed on in support of liquor stores, many opted to remain neutral as talks over the proposal played out. That very demand would come from consumers like Nick Huertas, a native of New York who says he could do without the hassle of traveling to a second store for his wine. But after today’s proceedings there’s likely to be no days of wine and roses ahead for consumers like Huertas. The age old difference that marks “where” New Yorkers can buy wine in the state isn’t likely to change.